Plasma CNC cutting machine is one of the most commonly used types of CNC machine. It’s used mostly for cutting Steel, aluminium and other conductive materials. Like any other type of CNC machine, plasma machine has it own specifics. Machine should be properly designed for such type of machining, considering slag, steel dust, high temperatures, moisture, grease etc..
For plasma CNC machine we recommend using Mk3 controller for its Ethernet support. Ethernet protocol is more robust than USB and therefore more suitable for industrious environments. Plasma cutter is a great source of electromagnetic interference. So special care should be taken into account when wiring machine electronics. Be sure to use shielded cables for motors, limit switches. External power supply for motion controller is very recommended. Plasma cutters itself sometimes do not satisfy standards of electromagnetic compatibility (EMC), so make sure that your plasma cutter is within EMC regulations. 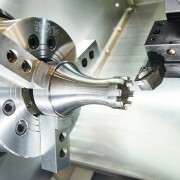 Special approach should be considered when designing toolpath program for plasma CNC machines. The reason for this is when plasma ignites and arc pierces trough material, this leaves a mark on material. So your work-piece could be well off from specified dimensions. For this purpose toolpath should include lead in and lead out moves. User should also pay attention to ignition delays, pierce heights etc..
You can use special CAM software intended exclusively for plasma cutting. SheetCAM software offers wide range of plasma toolpath options and it is very user friendly. PlanetCNC post processor is available. Heat emitted from plasma could deform workpiece material, usually metal sheet, in such case plasma cutter would not cut at constant height which could result as a faulty workpiece or could damage plasma cutter in the process. This is usually solved with THC device. THC stands for Torch Height Control. THC device measures arc voltage. Bigger the distance between the plasma torch and material higher the voltage and vice versa. So based on the voltage value we can maintain constant height of plasma torch above the material. 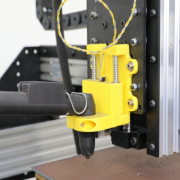 THC device sends control signals to motion controller which then dynamically compensates Z axis and thus maintains constant cutting height. Select decrease input pin of controller. Pin is located at Input header. This pin will receive compensation signal for axis movement in negative direction. Select increase input pin of controller. Pin is located at Input header. This pin will receive compensation signal for axis movement in positive direction. Select OK Arc input pin of controllers. Pin is located at Input header. Minimal height compensation value oppose to relative Z0. Maximal height compensation value oppose to relative Z0. Speed is step/cycle time. This should be set by testing, try finding value that suits your machine. Recommended values are from 1-10. 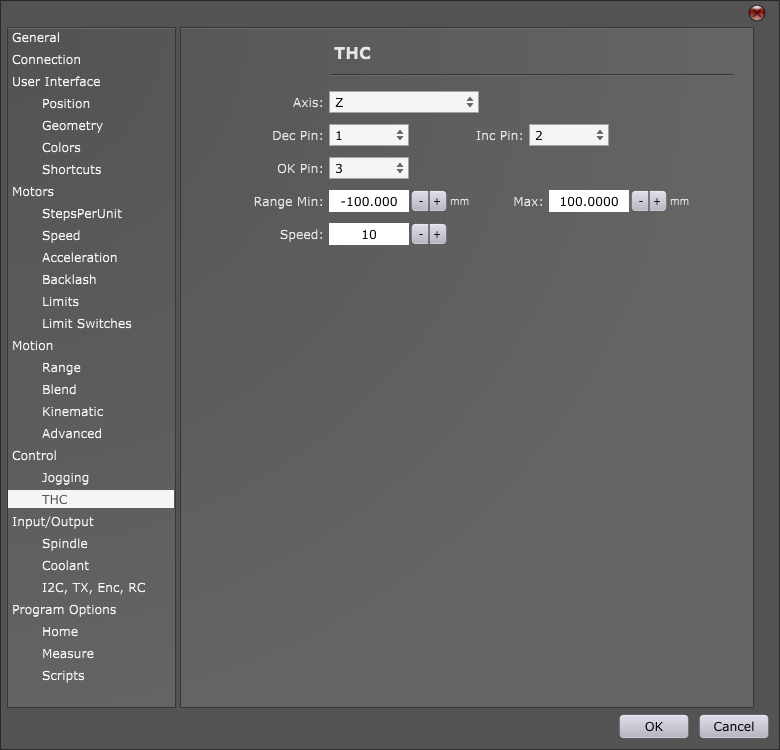 PlanetCNC TNG software uses dedicated g-code to enable and disable THC device. G-code M54 P1 enables THC, M54 P0 disables it.